What does Easy Rack do? We solve the problems of overhead that result from time delays, insufficient space, and facilities outgrown by business expansion. We supply companies with new and used material handling and storage equipment that provide a cost effective alternative offer alternatives to expensive corporate moves and new building construction. How do your tools help companies save money? We supply products to companies that help them make better use of existing space, and that also help make work safer and less time consuming. Our many commercial storage units will transform the unused vertical cube of a building into new space that in many cases eliminates the need to move. 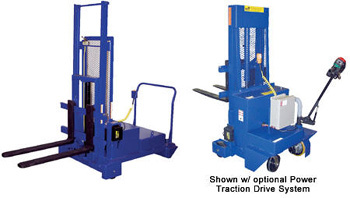 Our wide selection in material moving equipment enables companies to find the right tool for the right job and thus eliminate safety problems and time delays by making it simpler and faster to move supplies around the building. This improves process flow in two respects. Better tools and improved organization means less time is involved in moving and storage. This means safer working conditions for employees that may have previously been working with inadequate tools, and it means fewer overtime and weekend expenses. Do you have any used equipment? Yes. Our shelving and pallet racking products can be purchased either brand new or used in good condition. We are sensitive to cash flow issues and caps on procurement funding. When funds are limited, we offer the appropriate equipment used, providing our clients with the same fit to task without the added cost of brand new equipment. Easy Rack works within the parameters of your corporate budget. Do you provide only products, or do you provide services as well? We drop ship all of our materials directly to the location you specify. We also have recently expanded into the sale of all types of modular buildings, and we handle all of the setup of these structures as well as the shipping. Since our founding as a material handling solution source, we have also expanded into modular buildings and installation. Prefabricated modular buildings allow you to turn of unused property into new office space, security shacks, and additional storage buildings to their location at a fraction of the cost of new construction. In many cases, companies who are facing what they think is an imminent crisis in space find out that modular buildings make use of space that previously went unnoticed, or appeared useless. Construction companies particularly value this service because it allows them to literally build out an entire location onsite that can then be moved at will to the next job. Our sales begin with customer service, as we aim to provide you with information on what best meets the needs of your facility and business cycle. We know that every company is different, and every facility unique. We even can assist your with commercial lighting or parking lot lighting packages. Our specialists are trained to understand you first and pinpoint the areas where we can best accommodate your operations, cost reduction, and improved annual profits. This in turn makes the actual selection of products themselves much easier, and the purchase order more customized and streamlined to precisely fit what you need. Click here learn more about Easy Rack, read our product reviews or call us at 888-776-3720 to schedule a complimentary consultation today. Easy Rack specializes in all types of modular buildings, material handling equipment, pallet racking systems, industrial shelving systems, gantry cranes, jib cranes, ergonomic equipment and commercial lighting fixtures. Easy Rack installs modular buildings and pallet racking systems on a nationwide basis. Our home office is located in Houston, Texas with warehouses located throughout the United States that enable us to service all 50 states including Washington DC, Nashville-Davidson, Tennessee, Las Vegas, Nevada. Portland, Oregon, Oklahoma City, Oklahoma, Tucson, Arizona, Long Beach, California, Atlanta, Georgia, Fresno, California, Sacramento, Ca. Contact us toll free 888-776-3720 and let us build or install something for you! Pallet Racks & Installation | Tear Drop Pallet Rack | Warehouse Pallet Racking | Heavy Duty Pallet Racks | Industrial Shelving | Mezzanine Systems | Rivet Shelves | Shelving Systems | Long-Span Shelving | Warehouse Shelving | Used Pallet Racks | Cantilever Racks | Commercial Lighting Fixtures | Tennis Court Lighting | Sports & Athletic Field Lights | Parking Lot Lighting Kits | Material Handling Equipment Blog | Digital Scales | Drum Handling Equipment | Fabric Shade Structures & Tents | Material Handling Articles | Modular Building Sales & Modular Building Installation.